How many browser tabs do you have open? Just one or more, many, many more? We all do it. An open tab for email, one for Facebook, one for watching an Ebay auction, and a few more searches. It's called "tab creep". We're all creatures of habit and the tabs we have from left-to-right usually indicate the importance of the tabs. We open the most important ones first. Google Chrome has a cool tip managing the tabs. Specifically, any tab can be "pinned". By pinning a tab, it will shrink and move to the left. In addition, if Chrome is closed, pinned tabs will be retained when the browser is opened next. 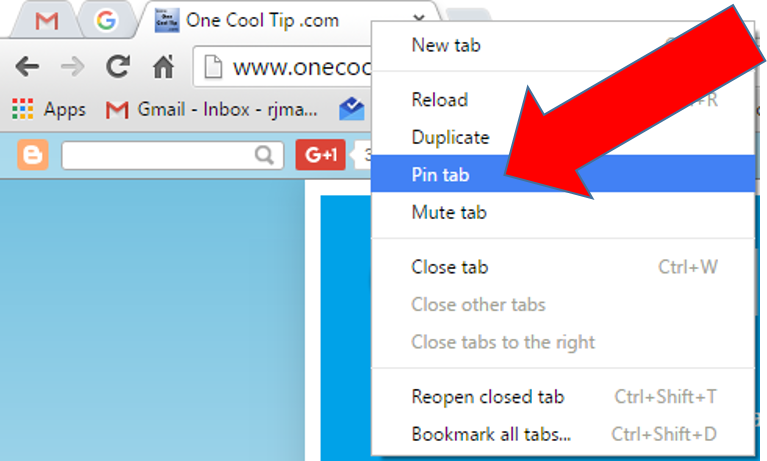 To pin a tab, right-mouse click on the tab and select "Pin Tab" from the dropdown menu. You'll notice that pinned tabs lose the close "x". To close a pinned tab, right-mouse click on the pinned tab and select "close tab". To unpin, right-mouse click and select "unpin" tab.